Because of the "right to pollute," the corporate power structure basically calls upon the “need” to pollute, in order to pose as fair, so that everyone can have the unquestionable advantages. We all want the same things, right? Maybe or maybe not, in a world on fire. At this stage, anyone promoting a lifestyle alternative or boycott can still be lambasted as a kook or enemy. Public perception regarding obvious pollution can be skewed by powerful manipulation, as recounted in Ibsen's play Enemy of the People. 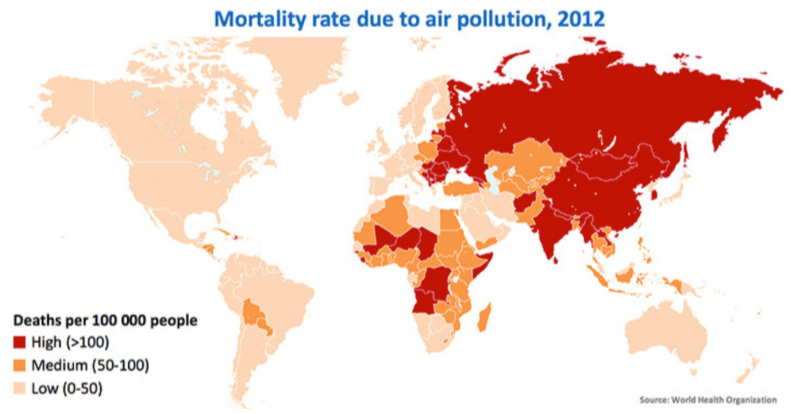 Meanwhile, health care costs relating to pollution — globalized, as in China’s being “the factory of the world” — are astronomical, although disease is ascribed often to other factors such as genes. Yet, scientists have held for decades that 80% of cancers come from environmental factors (which includes diet). The world is getting smaller, in terms of global effects affecting everyone. So whether pollution is generated in one's face or somewhere across the ocean, universal low cost polluting is perhaps — as disturbing as it sounds — at or near the top of our modern culture's value system where health does not rank high. The historic phenomenon is akin to freedom and wellbeing today being mostly the freedom to shop. One’s holding down a job can be said to be an unfair example of someone pointing at polluting. One is forced into commuting, using machines, etc., doing what one is told. But the reality is that modern work — not, say, the age old repairing of fishing nets on the quays — involves polluting in many guises. Exceptions are certain cooperatives where decisions are by vote or consensus, and making money is secondary to community and a healthy environment. But overall there is no hope of keeping down global temperature rise when ultimately the status quo must be maintained at all “costs,” and “jobs” are politically sacrosanct. This is true whether in the high-tech industry or other sectors of the economy. Even the average organic farm can have high-energy outputs, to participate in the marketplace. The vast majority of urbanized, domesticated humans is mainly on the lookout to use more energy — more energy than the world will soon be able to offer, as this former oil industry analyst has found. Pro-Big Business projections on growth of markets, population size, years left for oil extraction, and such, have various faulty assumptions. The system will meanwhile keep hinging on low cost polluting. But going into debt for polluting privileges is not always going to be seen as normal or advisable. Furthermore, it would be the case of the serpent eating its tail, if certain world events and trends can be deemed fatally exponential. With radical cultural change the universal practice of low cost polluting is going to be a dead end, perhaps sooner than mid-century when various growth scenarios blithely predict a continuation of business-as-usual. It is all part of a way of life to pay as little money as possible for energy-related services, goods, or any modern convenience; the alternative is to risk running out of money before the next pay check. Also, the idea of “getting ahead” based on “saving money” (for cheaper polluting) means constant vigilance as well; low cost polluting is held to be imperative and can never be openly questioned let alone foregone. To pay less across the board is pursued constantly, often for products relatively new to the market. The exception to successfully minimize costs is sometimes when an industrial monopoly or emerging technology is newly and firmly in place, thus making low cost polluting a bit more challenging to pull off. But one’s being fairly current with technological products (that fill the landfills) is seen as a necessity, compared to prior decades. It is another example of how low (or not so low) cost polluting became and remains unavoidably essential for the household budget — in the minds of consumers. The imperative of polluting at the lowest nominal cost has become the only game in town. Without consumers’ constant focus on avoiding or reducing costs of all kinds while consuming — in effect, for comfortably polluting — what would we be left with as a culture and economy? As it stands today, maximum consumption is pursued according to one’s means. But if people came to instead reject taking advantage of low cost polluting, or are forced to do so through unavoidable shortages, this changes everything. The degree to which that would happen could even result in an upending of the financial structure, and a possible alteration of class lines. This appears unthinkable today, but perhaps a movement is simply waiting to gel. Back to the land? Such adherents probably would not figure in a census. Meanwhile, the market response: if the corporate consumer economy were threatened, a simple strategy of lowering costs (prices) will buy off virtually anyone, and it buys a bit more time for the infinite (sic) growth economy. A Google search for Low Cost Polluting almost exclusively gives the result “Low-cost (Air) Pollution Monitoring (equipment)” [parentheses added]. 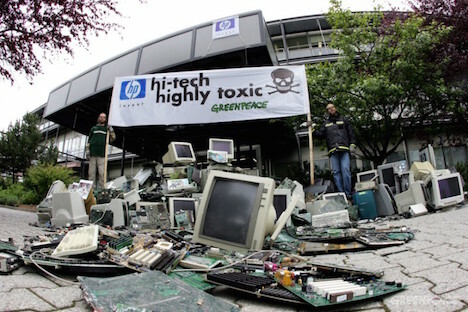 In one or two obscure publications, a non-equipment focus for “low cost polluting” comes up, but these writings pertain to ridding ourselves of certain inefficient, dirty technologies. This narrow finding of "low cost polluting" in Google points up the lack, heretofore, of a popular view of the underbelly of the beast. There has been no known focus on the reality of low cost polluting. One could rephrase it as “high energy living,” but that phrase is about two different matters: euphemistically in praise of a lifestyle, or, for quantifying certain industrial processes' energy components. This may be all the proof you need to agree that society has neither noticed nor acknowledged what is obvious: practically everyone expects and demands low cost polluting. Even the Air Pollution Monitoring equipment pollutes in and of itself, and the costs are distributed around society. And who could object? If a “reasonable deal” is unavailable from one vendor, another player in the economy is ready to assure that the system will persist, albeit for the sake of market share. Yet, a discovery in plain sight — that we are a culture now based on low cost polluting — means public discourse can, despite the fact that a basic practice is across the board, suddenly change. Then, society can change accordingly. Perhaps the realization of an absence of clothes on the Emperor — in this case, we may hear, that low cost polluting is obvious and pervasive — will contribute to fundamental social change. Until then we are in a vast enterprise: “Low Cost Polluters R Us” could be a start up, no doubt touting innovation, and could be coming to your favorite stock exchange. Many people might say, “So what? How can you have a problem with my trying to pay bills and have modern everyday essentials (conveniences)?” Without personalizing it or threatening what passes for security, yes, there is a problem: the planet’s carrying capacity and ability to offer an ongoing stable climate are fast eroding. One can only hope that a potentially wide audience may start discussing these matters meaningfully and consistently. Some citizens are thoughtful in action by trying to limit their consumption of non-renewable resources. They may maximize recycling (as long as it doesn’t cost too much), and they may even live what is called a simple lifestyle. Still, polluting costs must be maintained, if kept low, such as in keeping an old car. Others are full of rage about the loss of their Middle Class status, having expected continued low cost polluting. Many may blame immigrants, the Chinese, or even Wall Street and corporate America. No doubt the government is very wary of upsetting those who believe in the (non-existent) Constitutional Right to Drive — it’s a proud example of maintaining low cost polluting. War is the most polluting activity and has the lion’s share of federal spending, so those arguing over issues concerning the the slashing of the social safety net are dealing with crumbs that fell off the Pentagon’s table. In Greece, the blanket loss of consumer credit and onslaught of austerity-driven poverty are blamed on the central banks and “the Germans.” The crisis in Greece is thought of as only a money-supply issue, while ecological degradation and isolated consuming are barely acknowledged as factors. The average Greek, whether on the left or the right, wants financial relief that is not coming, and yet believes that the entire problem as well as the solution are all about money. Given that assumption, it goes without saying that low cost polluting will seem to the public as essential to try to uphold forever. “How Silicon Valley is erasing your individuality” is a cultural critique that appeared in the Washington Post on Sept. 9 of this year. The temptation to be super-connected electronically is strong, but there are negatives too: costs that a human must pay socially and personally. However, unsaid in the article is that everything depends on low cost polluting; one must think of all the entropy boxes for the landfill and the electric (usually dirty) power they had prodigiously consumed. Facebook, Google, and the whole raft of Internet services that are major electricity consumers boast cost-free services, although what one pays for the advertising profile (relinquishing some of our privacy) for unintentionally “erasing your individuality” has a high, unseen cost. 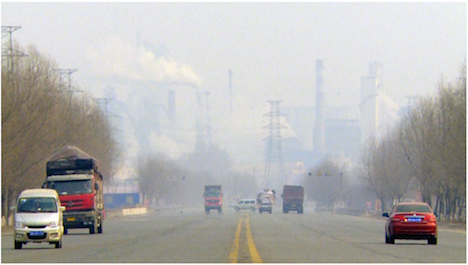 Food, shelter, clothing, and heat are essentials involving the development and maintenance of mega pollution systems. Yet, how did we ever manage a century ago, when energy costs were only just starting to figure in one’s life decisions? The human race had been growing in population, without the “benefits” of mass participation in low cost polluting. So, for those who are “cornucopian” and want more people on the planet, there is therefore no absolute need for low-cost polluting that's comparable to the scale going on today, to boost population growth. Maritime shipping — accounting for 90% of the world’s transactions — is cheap per-unit shipped thanks to economies of scale and vast subsidies to the oil and gas industries. Combining those structures with the “socializing” of “external” costs, the real price of oil is actually much higher than it appears. The most significant expenses for the maritime shipping industry are related to fuel (46%). Yet, deadly particulate emissions (60,000 deaths a year), oil spills, and global warming don’t come into the equation. Deadly “externalities” paid by society and by other species have allowed huge volumes of world trade — with no one to step up and answer for the downsides of consumer bliss and cheap goods coming from across the oceans. Economies of scale are achieved in many a business: the larger the volume transported and sold, the cheaper and more competitive the per-unit cost. Smaller operators have historically been edged out. The advantage of large scales is particularly true when one tries to eliminate polluting from the trade process: theoretical costs of conducting business this way often escalate into the stratosphere when not being able to compete with subsidized pollution. Dirty energy has given its banquet, but the party’s about over. The advantages of huge economies of scale will become a casualty of interrelated crises and general collapse having much to do with the ongoing, inexorable drop in high net-energy extraction for fuels. In an example in a world whose features will have transcended the legitimacy of vast economies of scale, sail transport of goods is on the rise. Sailing today for satisfying the niche markets is a model in place. Unsustainable conventional cargo ships’ (unfair) current advantages may become merely yesterday’s argument in this fast changing world. Out of sight, out of mind: the concept of energy slaves is an intellectual exercise, but something that all people should care about. Very few of us figure out the enormity. Having virtual energy slaves is a big part of low cost polluting, so when people are dependent on this entrenched system, something can be brewing: mass, convenient ecocide. The overtaxed ecosystem is never given time to recover during aggressive industrialism. Modern people enjoy having energy slaves whether they see the reality or not. Each American regularly utilizes, without thinking, the equivalent of 100 'energy servants.’ The energy or work output of a human body is about enough to keep just a single 100-watt bulb lit. This amount of energy output — 100 watts — equals one human ‘energy servant.’ It’s easy to see how one's energy slaves add up, and how it is an unquestioned good, part of “progress” for betterment of the human condition. "Free” plastic packaging or plastic goods — to preserve food, oftentimes — is acceptable as low-cost polluting as well as a fractional example of maintaining one's energy slaves. Yet, there are chinks in that armour, whether eco-philosophical chinks or a paradigm-shifting, deepening of community solidarity and mutual sharing. Or, more likely, involuntary termination of polluting is on tap; "how soon" is the sixty-four dollar question. Many who are aware of their consumer complicity in, for example, the BP Oil spill in the Gulf of Mexico in 2010, want to see “renewable” energy systems take over from fossil fuels to assuage our guilt. Not only is a technofix doubtful, for reasons this column has often offered, the biggest and suppressed sticking point is that all this energy is simply assumed to be necessary. The future will eventually be scaled back both in terms of gluttonous as well as moderate energy use, and possibly in the total number of people participating. Renewables can play a role, but most likely in decentralized and low-tech situations. 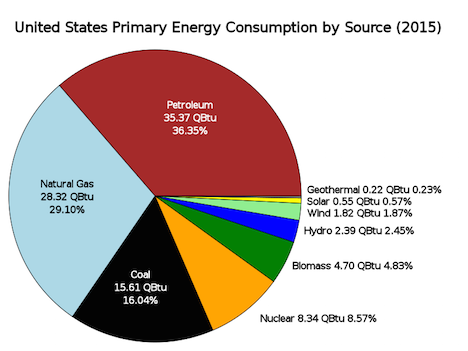 Yet, everyone continues to pay as little as possible for energy today, while using subsidies for both new and alternative technologies. Some try to beat the system or “save the Earth” with a biodiesel vehicle, investing in solar panels, and the like. These examples are not so unknown these days, but still depend on the entire market system and industrial processes involving non-renewable resources. What do modern people have in common most? A religion? Allegiance to a state or an empire? No. It’s low cost polluting: they can either be a selfish mega consumer or even a social justice activist getting by on his or her vow of poverty. It’s all the same, because the advent of low cost polluting was an historic change for humanity. As a people we initially took note of it, then appreciated it, soon we expected it, and then demanded it: we "naturally" increased our low-cost polluting. But it cannot be ever-increasing; actually it has probably peaked. 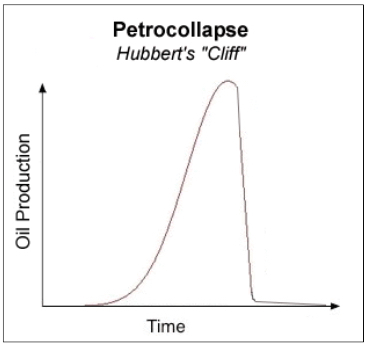 This is when the trouble starts, due to the precarious dependency on mainly "cheap" oil that is depleting ever more rapidly, barely replaced by unconventional, lesser-quality, more difficult to extract crude oils. One can consider today’s fixation and dependence on science and technology as the dominant “religion,” but the application of these ingenious phenomena are actually to satisfy — yes, you guessed it — low cost polluting. The side-effects are seldom taken as blameworthy by the individual polluter. Not that religions necessarily have universal validity for people today. But certain features of religion or spiritual philosophy are absent in one’s having a life purpose (in effect) of maintaining low cost polluting. So, although comprehensive, this “religion” is incomplete. For a religious life, not only is a high amount of polluting (at low cost, when possible) not explicit in the belief system, the opposite — an ethic to minimize one's pollution — is more rare and has had negligible impact thus far. Neither an SUV owner with a religious bumper sticker nor a car-free, bicycling worshipper of Mother Nature are of much general interest, as long as everyone else can do their low cost, polluting thing. Low cost polluting is going on all the time, crossing not just class boundaries but all boundaries — except for some ethical people whose way of life doesn’t allow polluting at any cost. If so followed, this stance can constitute an “immense” sacrifice, and often brings on derision by those consumers who push for conformity. Addicts love company. But eventually, as movements go, a few citizens emerge as visionary. Low cost polluting is almost the purpose of living, willy nilly, for shall we say all modern people. This is evident in their choices and lifestyles, no matter how hapless or hopeless or even aware the consumer may be. Americans, with 100 ‘energy servants’ each, share blame for Gulf oil spill , Report on Energy Slaves, Culture Change, by Sarah (Steve) Mosko June 18, 2010. Green Car Congress: UN IPCC releases AR5 Synthesis Report on ... "For too many posters, it is more important to drive low cost polluting gas guzzlers than to invest a few more dollars in clean running lighter..." - a comment only, on Nov. 3, 2014. The report appeared Nov 2, 2014. To be electronically polluted, phone-plan charging or cable TV packages are considered more important than planting a fruit tree.